We live in the Golden Age of the Internet, where Google is King and Facebook is Queen. Everyone can use a website for some purpose or other – and having your own website has never been easier. Whether you’re the owner of a small business, a proud member of your local community, or a writer eager to share your stories with the world having an online presence is extremely valuable, if not a neccesity. Don’t have a website yet? With SimpleSite you can build your own FREE website in minutes. It is extremely easy and stays free forever! Click on the green button. The Internet is never closed or on a break. Even on Sundays or holidays. You can reach out to your customers literally every hour of every day and every day of the week, all year long! Think about it: even when you’re asleep or otherwise occupied, your website is doing business for you! In this day and age, a business without a website is not taken as seriously as a business with a website. Having your own website does not only make you appear more professional, it also makes you come across as a trustworthy business. Why not show your business off? With a well-designed website you’ll be sure to give a good first impression to your customers. Having a great-looking website increases your credibility tremendously with potential customers, and in the end it might be what makes them buy from you and not your competitor! A website can not only be accessed 24/7, it can also be reached from any device. 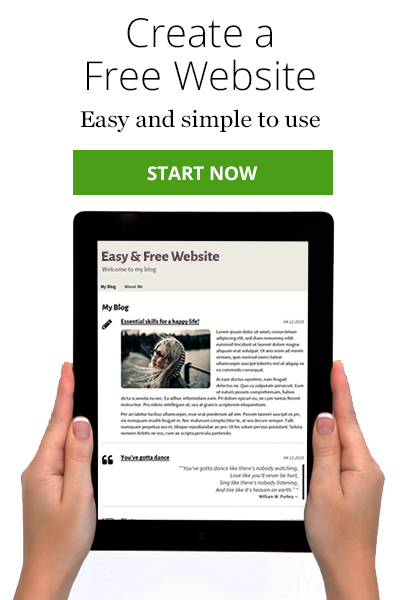 Naturally, all SimpleSite websites are optimised for all devices, be it PC, mobile or tablet! Gone are the days when people were only online when sitting behind a computer. Today people are online all the time. Checking their phones on the go, in the couch, in bed. With your own device-optimised website you can increase your reach even further. Listening to your customers can be hugely powerful. Use comments, guest books and contact forms to let your visitors leave you feedback. You'll get an even better understanding of who they are, what they need and how you can communicate better with them. People use search engines (primarily Google) when looking for anything on the internet. Your business can most effectively be found online if you have your own website. A facebook page alone won't do that for you. Ready to get your business online and reach a whole new customer base? SimpleSite also has its very own online store module you can use for FREE. Make your own website with online store today.